I thought we were done with Restaurant Week, well, I thought wrong! A couple friends of ours had invited us to join them for dinner Saturday night at Salpicon. I’ve been there once before with my sister and brother-in-law, maybe 5 years ago. I remember walking away fully satisfied both in my belly as well as my taste buds. So, the opportunity to dine there again, at the discounted restaurant week price, was too good to pass up as we’re not ones to miss out on top-notch Mexican food at a discount. Hanging out with Tony and Sandra was also a nice proposition which certainly didn’t hurt the matter. I must warn you that I did use my cell phone camera again. The pics do not do the food the justice they deserve, but what can you do? Also, since there were four of us I have a lot of pics to show. They offered 5 different appetizers as well as 5 different entrees. What we did was order the 4 most interesting of each and shared them all. I’ll try to keep this post short, but no guarantees. 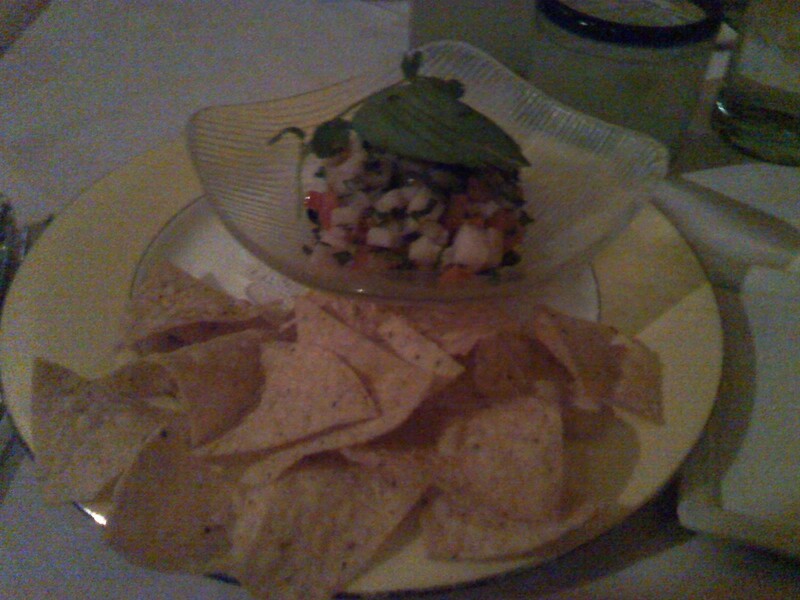 Ceviche of Blue Marlin. Very typical with onions, tomatoes, chiles, and cilantro. Served with tortillas it always makes a great starter. Gorditas Divorciadas. Thick tortillas stuffed with black beans and shredded beef (I think brisket, which completely satisfies the Jew in me). They each had a different salsa. 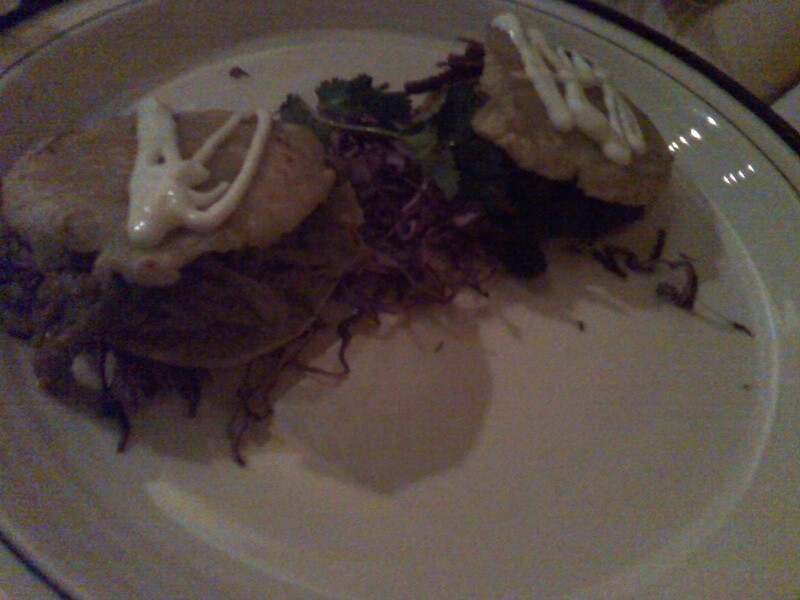 One was a guajillo and the other was serrano-tomatillo, both had Mexican crema drizzled on top. 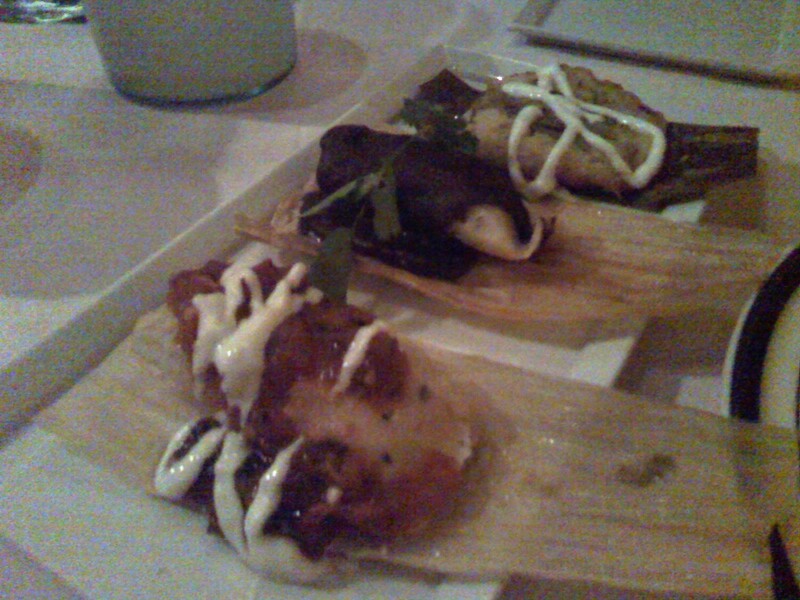 This was the Trio de Tamalitos. Three little tamales, one with queso fresco and serrano chiles that had a spicy molcajete salsa and crema, another with black beans, rajas (a saute of chilis and onions), and chihuahua cheese with a black been puree, the last had zucchini and chipotles. 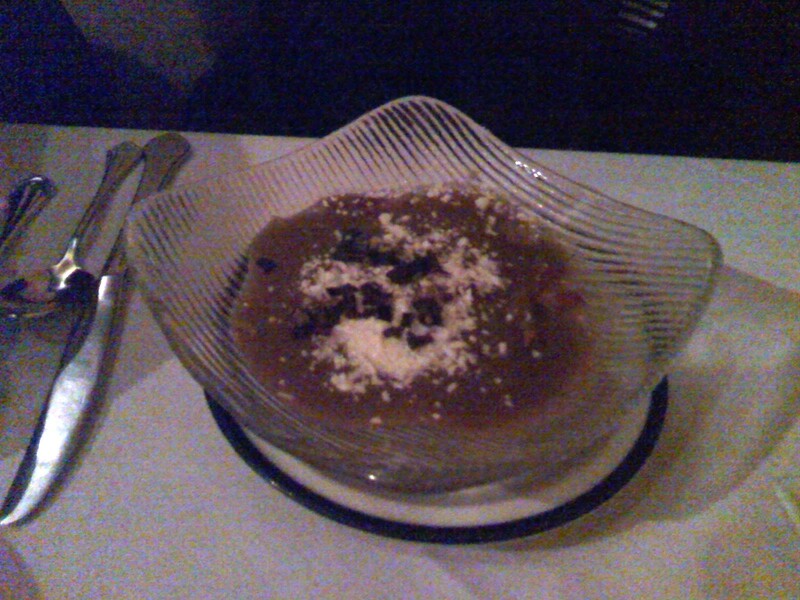 The last appetizer was Sopa de Lentejas, lentil soup. 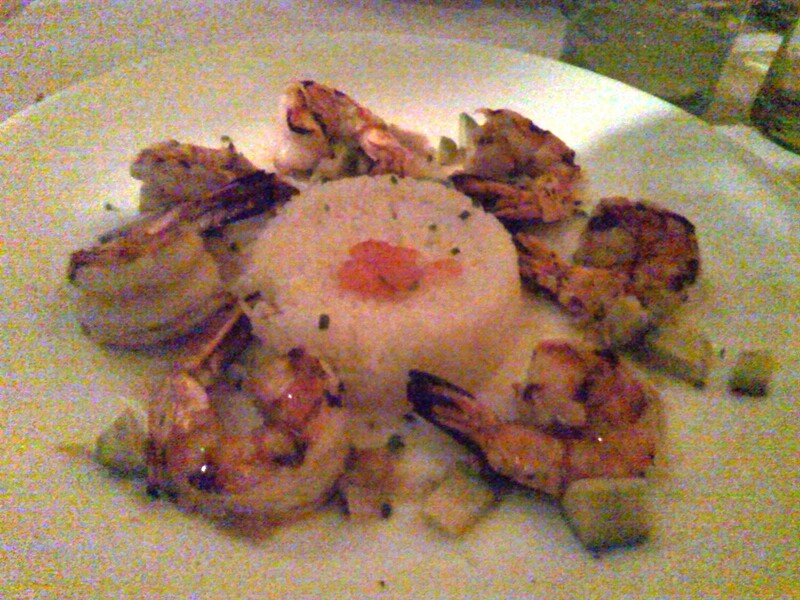 It was garnished with grilled pineapple, smoked bacon (YUM!!! ), chile pasilla, and queso anejo. For the entrees we got the Camarones al Mojo de Ajo. Big, plump, juicy grilled shrimp in a sweet garlic and olive oil sauce with avocado chunks, guajillo chiles, and white rice. Not too garlicky at all. 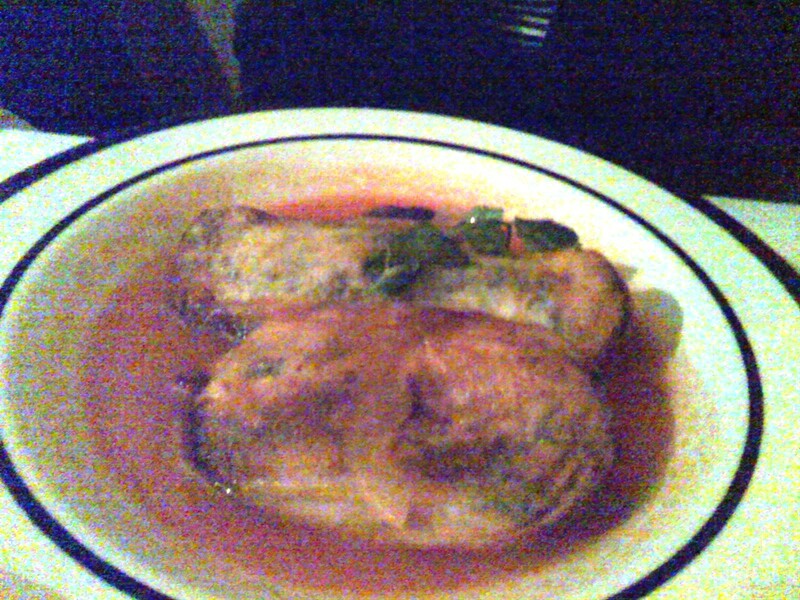 Chiles Rellenos. Two battered poblanos deep-fried and swimming in a roasted tomato sauce. One was stuffed with minced pork picadillo, the other with chihuahua cheese. There was a side dish of frijoles borrachos, but I forgot to get a pic of that. Deal with it! 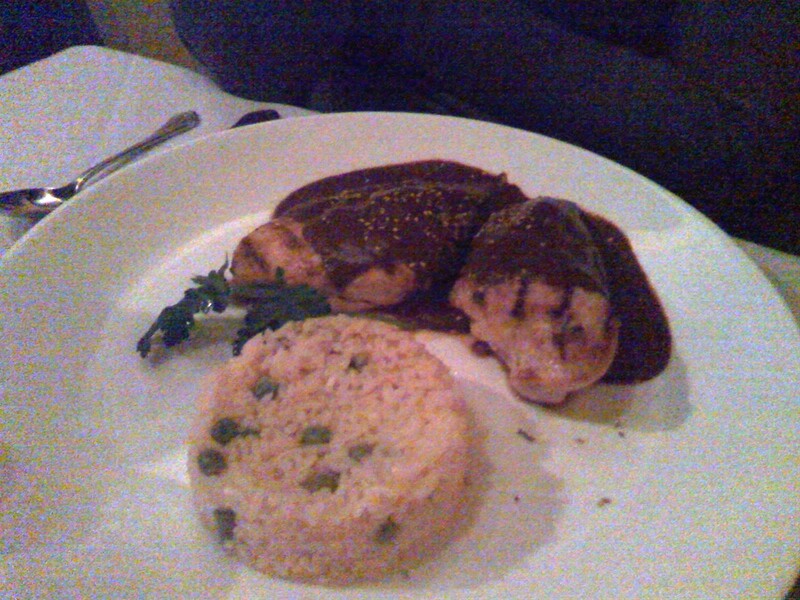 Pollo en Mole Poblano. Two chicken breasted smothered in a rich, spicy mole and served with Mexican rice. It really was kind of spicy. My first bite gave me a couple of little hiccups. 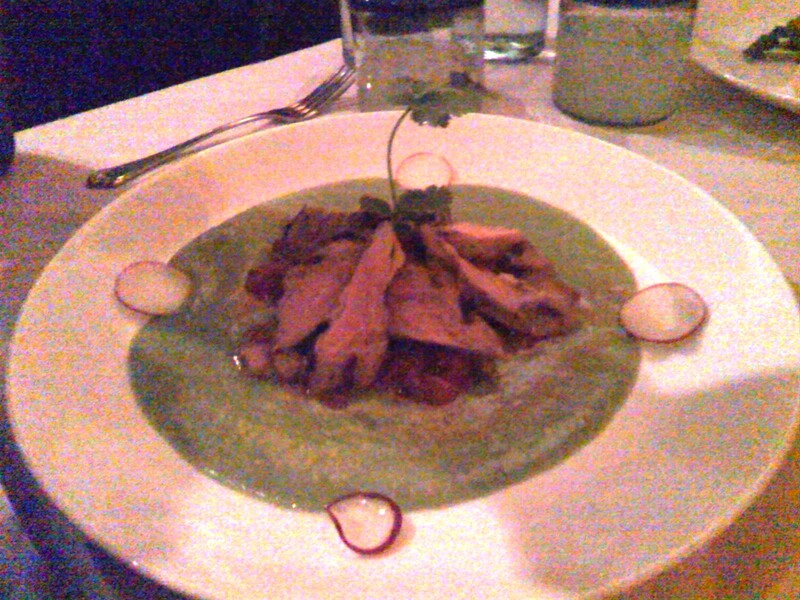 Tinga Poblana. Pork tenderloin on top of a roasted tomato-chipotle sauce with chorizo and potatoes, surrounded by an avocado-tomatillo sauce. This was hands down the best in show! Nice soft tenderloin and chorizo….how could that go wrong? Alright, time for dessert. 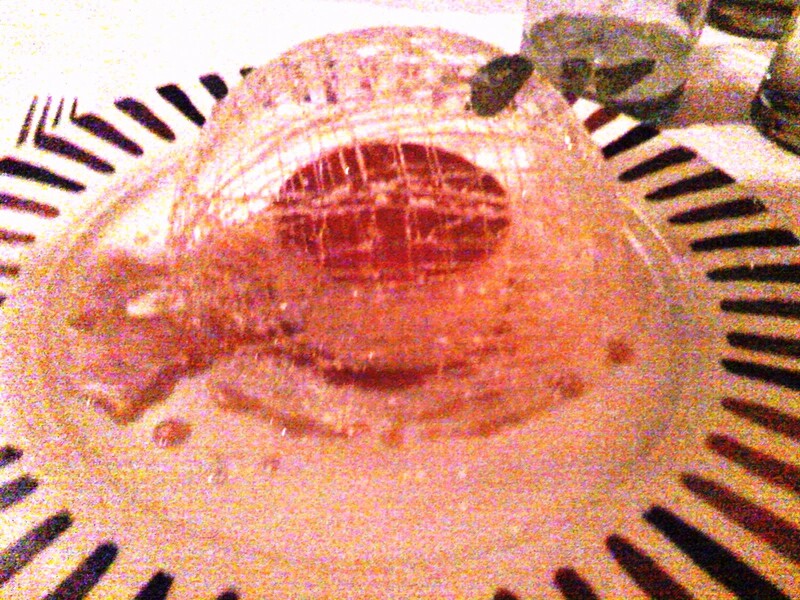 We got a flan that was covered in a sugar dome. A crepe filled with berries and a caramel sauce. 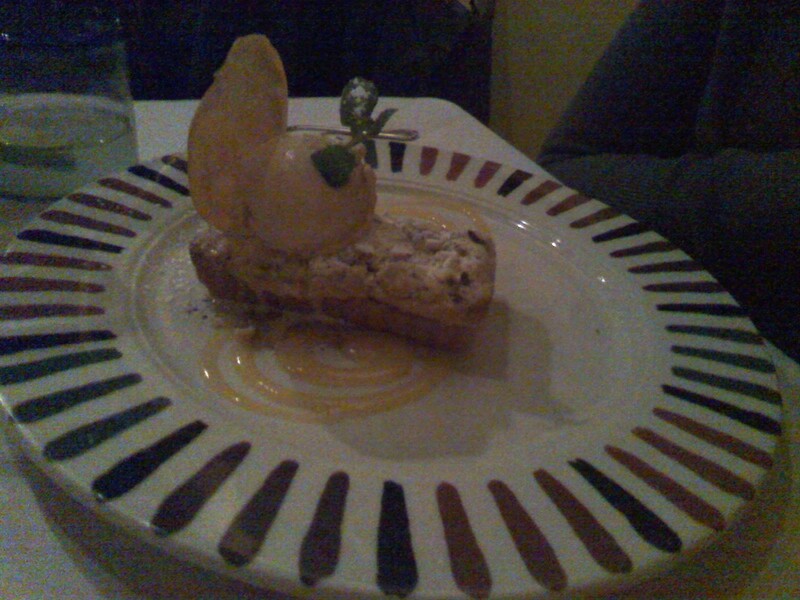 My personal favorite was the mango and pear cobbler. 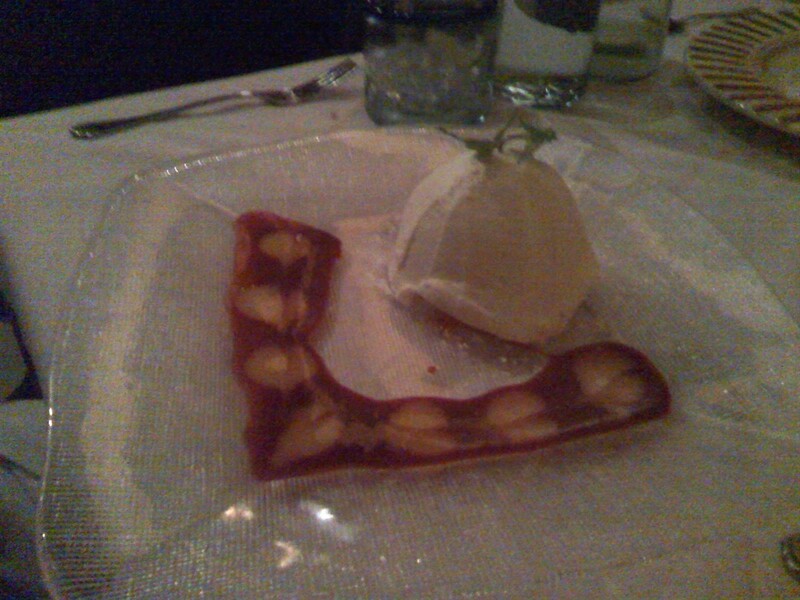 Not sure what it’s actually called, but it sure was delicious with the cajeta ice cream on top! All in all it was a delicious dinner. 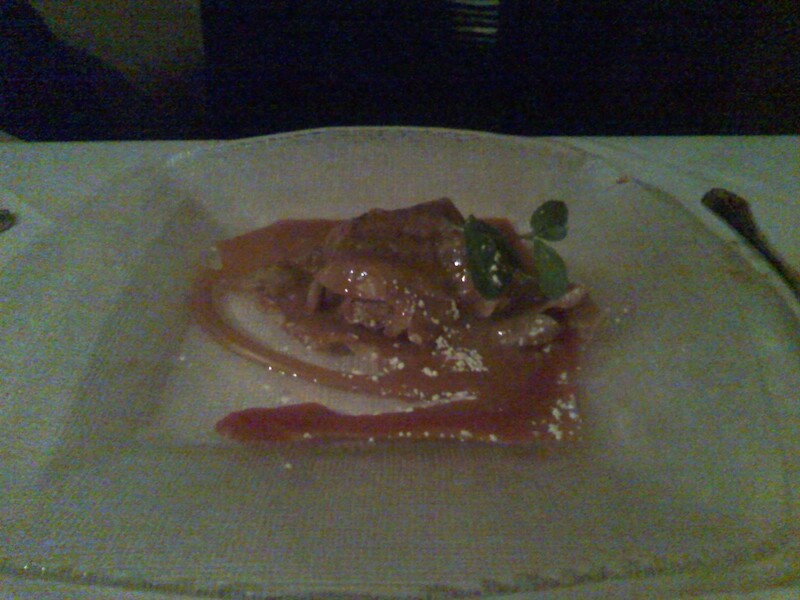 It’s every bit on par with Rick Bayless as far as creativity and quality. While I just found out that they offer a $29 pre fix every Monday and Tuesday this restaurant week deal might not have been the best offer. However, on a weekend night it was. I would recommend to everyone that they check Salpicon out for the pre fix deals. If you don’t want a limited menu, it’s also definitely worth paying full price for.